It’s officially Spring and if you are anything like me that means you are itching to get out into your garden! This Spring I am really looking forward to replanting our family’s kitchen garden full of veggies, fruits and herbs we use often in our home. One thing I always do before I begin planting my first seeds or sprouts, is to take some time to plan out and prepare our upcoming garden! Here are some tips that I’ve learned over the last few years of suburban veggie and fruit gardening. Will you be planting in pots, in raised beds or in the ground? If you are planting in pots, will you be using terra-cotta, which wick away moisture very fast and need frequent watering, or glazed pots or even plastic pots? What type of soil will you be using – if planting in the ground do you need to amend your soil before planting? 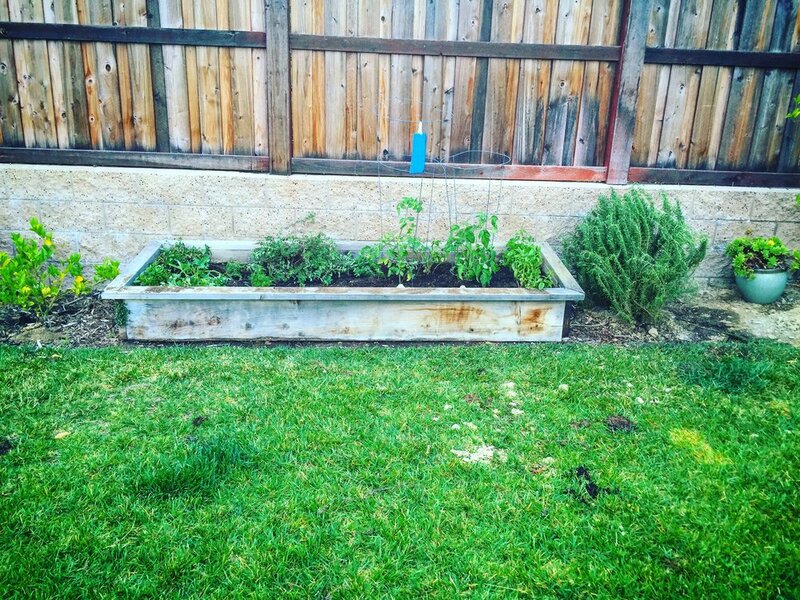 Even if you have a raised bed garden you will want to turn over and refresh your soil , since the soil will lose some nutrients over time and use. Get in there with a shovel and trowel and turn over the soil breaking up any clumps and aerating the soil as well. I then add in some of our home-made compost. Using the shovel I fold that into the soil working it deeper into the bed. Then I add one fresh bag of EB Stone Organics Raised Bed Potting Soil. How much sunlight will the area receive and at what times of day? Is it under shade most of day, close to homes or walls (which hold onto both ambient heat in colder months, and ambient cooler temps in hotter months)? What about the typical conditions of your spring and summer season? For example here in San Diego, we have lots of cool and wet mornings with coastal fog during our late spring and early summer (May Gray, June Gloom) yet we get really hot and dry typically from July – October. During those cooler and wetter months I don’t mist as often, preferring to water my plants about 2-3 times per week with deep thorough hose waterings. During the hotter months we mist and water three time per week, using the irrigation system hooked up to our beds. What types of fruits and veggies do you and your family enjoy most? Those are the ones to plant, considering the climate and seasonal needs of the plants of course! Are you familiar with COMPANION PLANTING at all? It is the the practice of planting certain types of plants together because they benefit each other. Companion planting herbs and flowers amongst your crops, can also be hugely beneficial for PEST CONTROL. In our garden, I always plant basil and dill next to my tomato plants - since they are helpful in keeping the dreaded horned tomato worm away! (Don’t let the name fool you,it’s a caterpillar not a worm). I also plant each bed with chrysanthemum flowers since many garden pests do not like those flowers. This year we will be including nasturtium to our garden beds due to aphids affinity for them (keeping them away from my crops) and also because they are totally edible and medicinal as well. This is the first installment of our Kitchen Garden Blog focus. In my next post I will go into COMPOSTING - how we compost and why. So stick around for the next post!